Great ballistics from a mainstream handgun round that is reliable in all mainstream firearms and can pack a decent punch considering the great price point and the unassuming build. 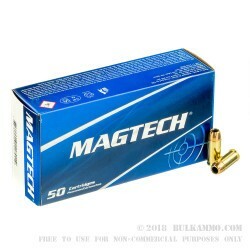 This is a 180 grain jacketed hollow point projectile that is set into a premium cartridge by MagTech and offers a true “single purchase” solution for the .40 S&W, if you are content with the excellent static ballistic performance of the round. 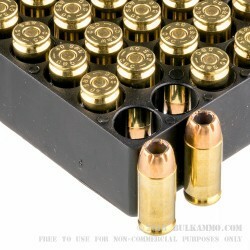 The static ballistics are as follows: 990 feet per second velocity and 390 ft. lbs. of energy, which is excellent for the load and grain weight. 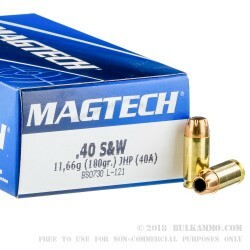 MagTech has a great performer on their hands for people who want to shoot on the range what they shoot in their duty pistol or personal defense carry weapon. You don’t have to sacrifice much to save a ton of money and the performance is reliable and consistent and provides you with peace of mind at a great price point. 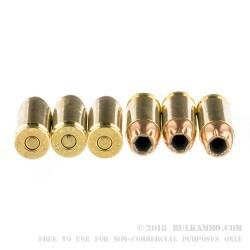 The cartridge features a brass, Boxer primed case, that is easily reloadable and the powder, while slightly dirtier than some other premium load offerings, still offers a very good range experience and has no legitimate drawbacks as a general use powder.